Methane is a very potent greenhouse gas - some 21 times more potent than carbon dioxide. Methane is produced by sheep and cattle as part of the normal processes of fermentation of feed in the rumen. This methane is estimated to contribute 14 per cent of Australia's total greenhouse gas emissions. 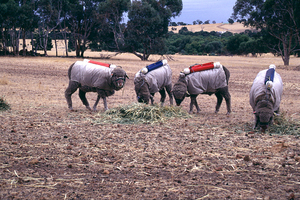 This image shows sheep fitted with mechanisms for collecting exhaled methane. Methane is produced in the rumen of the animal by small micro-organisms called methanogenic archae, or methanogens, and the gas is breathed out. Methane production represents between two and 12 per cent of gross energy intake. It therefore seems reasonable to expect that production increases in this range would occur if methane production were reduced. For the last 10 years, CSIRO has researched a number of approaches to reducing methane production in sheep and cattle, and holds several world-wide patents on a range of technologies. The most promising approach to date is vaccinating the animal against their own methane producing organisms.